In addition to ‘Endeavour’ and ‘Nancy Grey’, another yacht caught my attention. 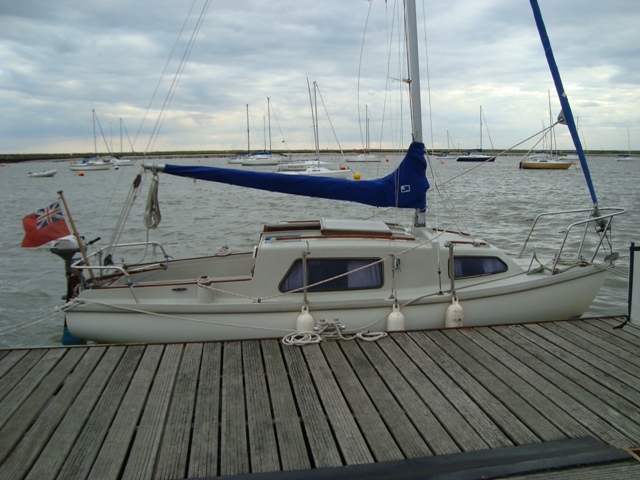 She was ‘Patrice’, an Oakleaf class yacht built by Sutton and Smith of Great Wakering, possibly between 1970 and 1972. I didn’t find her as aesthetically attractive as the others, but she gave the appearance of being a practical vessel, suitable for East Coast cruising. These 28’ wooden clinker boats, with four berths and a separate head, also have a decent size cockpit large enough for a crew of four. 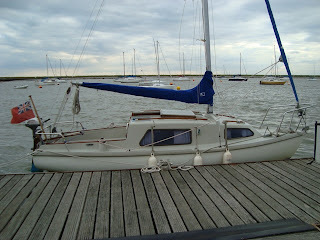 ‘Patrice’ has been fitted with a bowsprit for her furling jib which will help in light airs. The wooden interior of a traditional yacht such as ‘Patrice’ can be a home-from-home, providing warmth and comfort, a place of refuge on a cold winter’s night. She would have a double leaf table that hinges out from her centreboard case, and long lounge seats either side that convert into bunks. In the forepeak she would have two separate bunks. 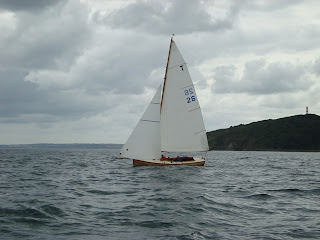 There were other yachts of interest, but I’ll just mention one, this shapely gaff cutter with a taffrail stern. Despite her short waterline I think she would be a slippery little thing, very exciting to sail with her crowd of canvas – good fun too working those running backstays. Continuing my amble along the sea front at Leigh-on-Sea I deliberately focussed my attention towards the water where a few interesting yachts were tethered to their moorings, gently jigging to the ebbing tide. I thrust away all thoughts of the bustling activity behind me made by bank holiday visitors; the sound of their voices and the hoot of a passing train could not draw my gaze away from the yachts. I knew that within an hour they would return to their mud berths where they would remain until the next high tide. I mused about this, and of the inherent dangers to those who did not understand the workings of the sea. Each year, our local inshore lifeboat is called to rescue people who stray onto the mud for a cooling dip in the murky water, or to wade knee deep in the dark, squidgy mess. Shallows beyond the outer banks have become a venue for kiteboarders, adding to those who have who have run into difficulties requiring rescue by the lifeboat. A peculiar thing about seaside towns like Leigh-on-Sea, where high water briefly comes within touching distance, but twice in twenty-four hours; sometimes they have the suffix ‘on-sea’ added to their name. Next door to Leigh, there’s Southend-on-Sea, and further north there’s Frinton-on-Sea. 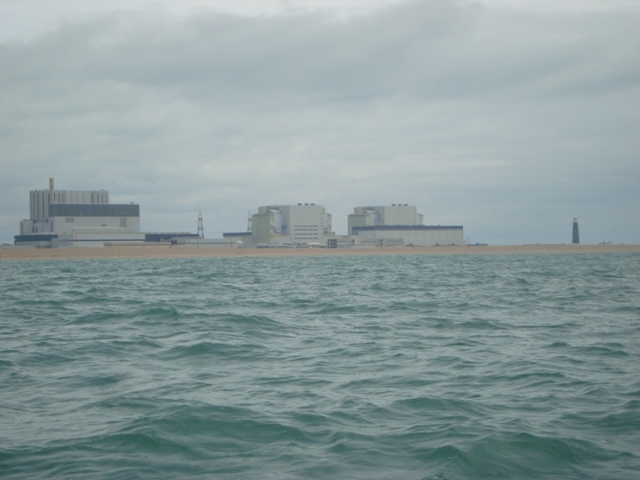 At these places the sea remains aloof for much of the time. Two or so hours before high water, a surging flood of muddy liquid sweeps up Leigh Creek. 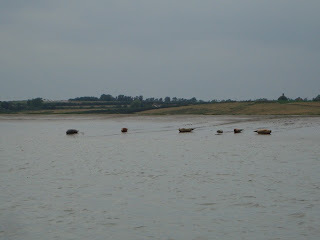 Within minutes it swallows surrounding mudbanks to release vessels that were stuck in gunge. They pop out of the mud and assume a perpendicular stance. If Aeolus ruffles the surface they dance in unison to his piping tune. After admiring ‘Endeavour’, the lovely Woolworths green-painted smack, my gaze fell upon a beautiful barge yacht, the ‘Nancy Grey’. I love her long clean lines, fairly low topsides and varnished cabin trunk. Everything looks just right, including her swallowtail burgee, her Wykeham-Martin furling gear and her large leeboards. She’s a vessel I have admired over the years since I moved to Essex decades ago, and whenever I visit Leigh I seek her out to have a glimpse of her. This 30’ yacht was built by Shuttlewoods of Pagelsham in 1939. More can be discovered about her by searching the links below. Anyone who would like a full-size photo of the one above for wallpaper on their computer, just give me your email address and I’ll send it to you via attachment. Paul, if you are reading this, and want a photo, please get in touch. I know you have an interest, because you have subscribed to bargeyacht’s YouTube Channel, which features the ‘Nancy Grey’. 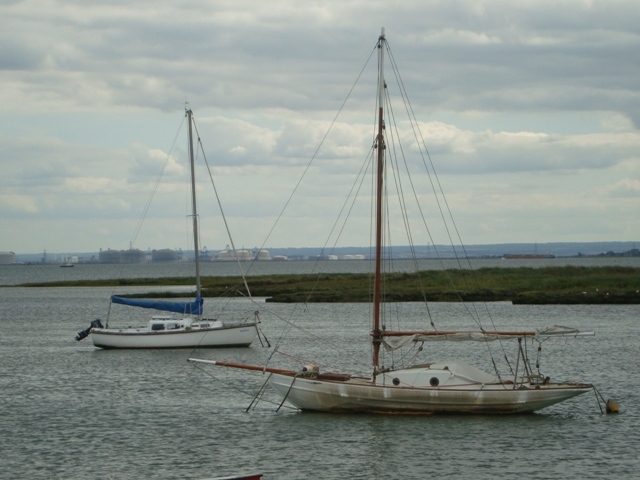 Leigh-on-Sea is very well-known for being a venue for fresh sea foods, especially, cockles. 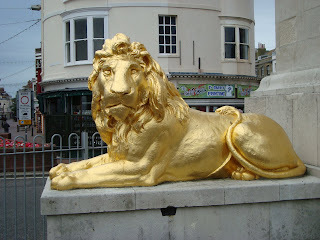 This late summer bank holiday I walked along the sea front to take in the flavour of the place. 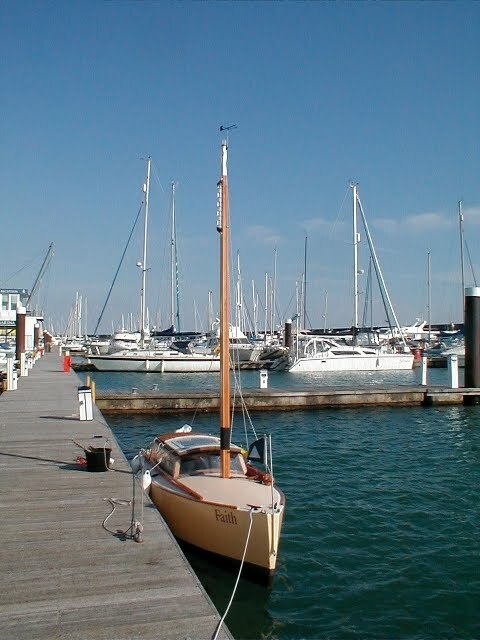 Without a doubt, Leigh has character; there are the old, quaint houses and shellfish processing sheds, pubs, art and craft studios, restaurants, fishing boats, yachts and boating clubs. There’s even a small stretch of sand for the kids, and acres of dark, squelchy mud at low water. Hordes of visitors sat in the open air at pub benches admiring the view over the water while eating sea foods and downing pints of ale, lager and soft drinks. Kids, mums and dads, dogs, ice creams, candyfloss, prams, slow moving cars on a narrow road by the railway line, all contributed to the thronging scene. My eyes focussed on a nearby smack, painted in Woolworths green. 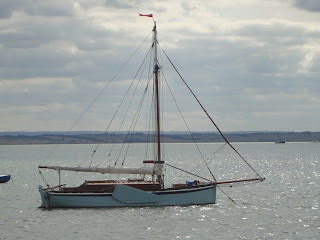 I remembered seeing her in Leigh Creek years ago, without a mast and looking forlorn, as if she had given up all hope of being cherished again, but there she was, with her short stout mast, tanned main and painted boom resting on her counter in traditional style for shedding rain. No ugly raised cabin disfigured her workmanlike appearance, much to the credit of her owner. Instead there was a low profile trunk, barely visible above her gunwales. 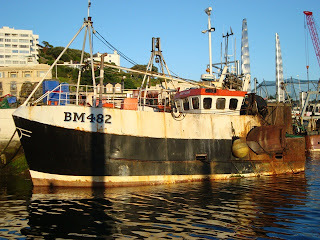 She was registered as LO 41 and she had the name ‘Endeavour’ painted on her transom. I admired her sturdiness and full-bodied hull, her transom-hung rudder and curved metal tiller. Unusual for a vessel of this type, I noted that her mast was stepped in a tabernacle, instead of passing through her deck to the keelson. 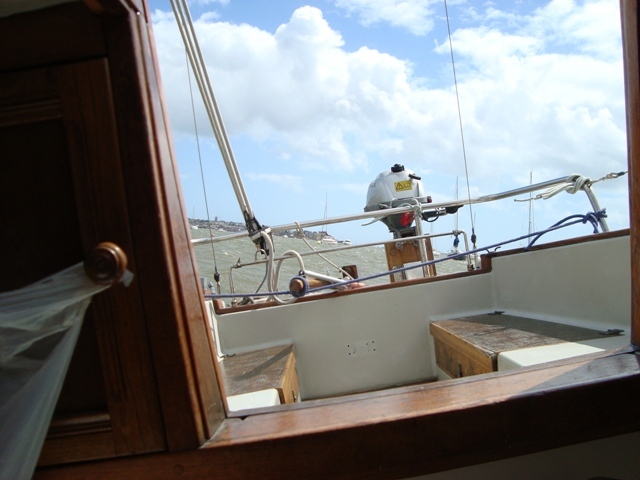 Her clear foredeck and side decks gave easy access for her crew when anchoring and shipping the bowsprit. 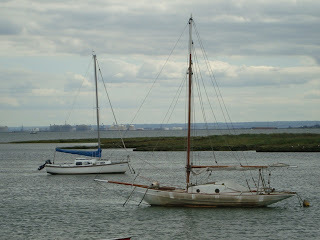 Other sailing vessels were equally interesting to me, but they will be left for another day, even tomorrow perhaps! You’ll have to wait and see. 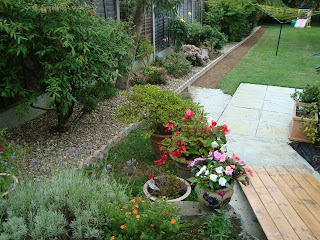 For the past couple of months the weather here in the UK has been decidedly unsettled. Yesterday, 27th August was typical with sunshine and showers, calms and windy spells – not the fine weather I hoped for to go camping with ‘Talitha’, my small, homebuilt keelboat. That’s nothing new, because the weather for this time of year is running true to form. It is the hurricane season for the Caribbean and eastern seaboard of the US. These unwelcome, awesome natural phenomena wreak devastation upon whomever they choose, causing loss of life and vast damage to property. As I write, Hurricane Irene threatens Battery Park City in Lower Manhattan, where residents have been evacuated; likewise there’s a prediction that Long Island, east of New York City could be subjected to a storm surge that would be far more lethal than havoc caused by the wind. By comparison, we in the UK seldom experience winds of hurricane force, but we feel the after-effects of hurricanes when they diminish in force and expand while travelling over the Atlantic to bring rainstorms over Britain. 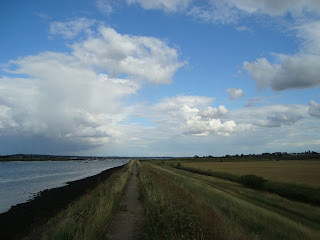 Scotland normally takes the brunt, while the south east of England sometimes escapes. On Saturday afternoon I took a walk beside the river Crouch at South Fambridge, and my attention was drawn to the sky where there were volatile clouds, rapidly changing their forms and colours. Gusts were accompanied with light showers that sprinkled rain drops on my anorak, soon to be dried by the wind and fleeting bursts of warming sunshine. I couldn’t resist glancing at a beautiful Pioneer 9 that lay to her mooring waiting for her owner to take her for a spanking sail. She was like a pup, impatient for a romp when he heard sound of his master who returned home from work or a hound anxious for the hunt at the call of the pack. The graceful blue yacht so reminded me of my Pioneer ‘Aziz’ when she was alive. 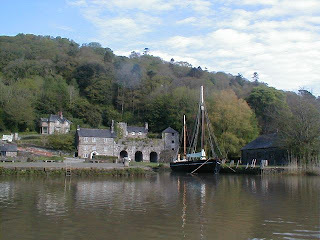 Now she’s all but dead, propped up on a quay at Calstock, Cornwall. 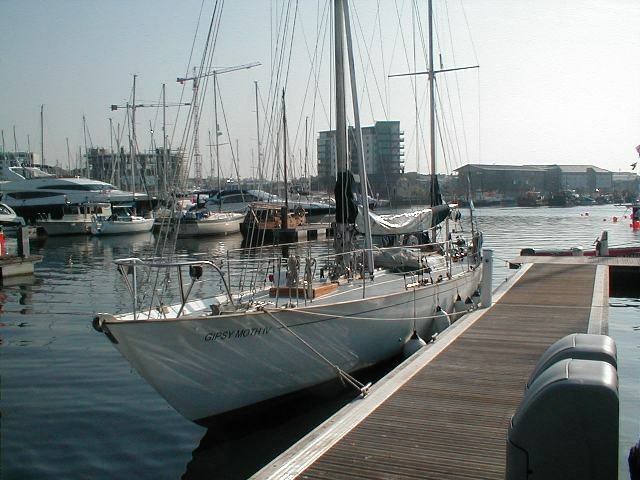 Could this famous yacht be revived and preserved as a living tribute to Nicolette Milnes-Walker, who sailed her across the Atlantic to become the first woman to do it without putting into port en route? If only I lived near Calstock I would be inspired to form a consortium of interested partners and sponsors to bring it about. A group of enthusiasts is all that is needed. They could share her between themselves, finance the project and carry out the necessary renovation. I speak as an oldie, but I believe our young people of today are being portrayed as unthinking, disobedient and selfish. When I think of my own youth, I was a bit of a rebel; not that I deliberately disobeyed my parents, but I would do things they would not have approved; for example, I stole a cotton reel from Woolworths. Why I did it I do not know. Was I attracted to the colour of the thread? Could I get away with it? Did I enjoy the adrenaline rush it gave? I also stole a small bar of chocolate that was a laxative, and I paid the price! On a completely different scale, only recently there have been riots in the streets of UK cities when three Birmingham men died after they were hit by a car. Youths have largely been blamed for the rioting. I can’t believe that all young people are tarred with the same brush. There are examples to prove they are not; take the group of seven UK youngsters who founded YPDG (Young People Doing Good), and the initiative in the US aimed at getting kids to contribute to the community (Teens Team Up to Give Back) – see links to their websites below. We hear of the importance of role models for our children, the likes of sportsmen, pop stars, film stars and even the Royals. Not all of these are beneficial, especially some of the so-called celebrities with chequered backgrounds. There is one role model that some young people are looking up to today, and that’s Laura Dekker. As young as she is, she demonstrates that a young person can achieve things that were thought to be impossible by one so young. She shows extraordinary determination and tenacity. She is living proof that young people can do astonishing things; she’s an exemplary role model. Yesterday, she arrived in Darwin, about halfway around the world, in her attempt to be the youngest person to complete a solo circumnavigation aboard a yacht. 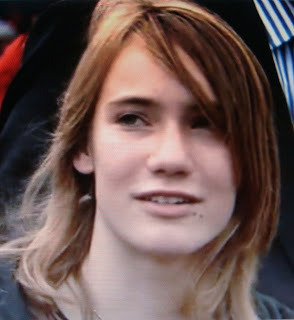 Is she an exemplar of modern youth, i.e., one who represents and reflects the character of young people? I would like to think there are many youngsters doing positive things, just like Laura. Well done Laura, and God speed! 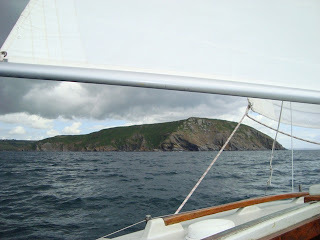 As promised by me yesterday, here are more photos taken during my South Coast cruise to the Scilly Isles. ‘Kaskalot’ was one of the spectator vessels. 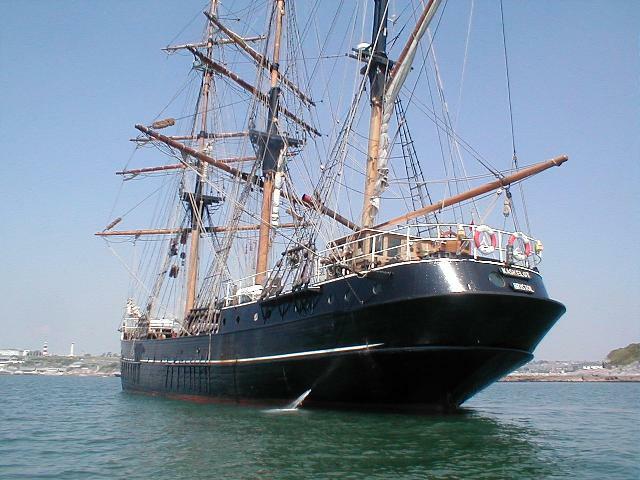 This 153 ft oak on oak replica three-masted barque was built by J. Ring Anderson, Svendorg, Denmark in 1948. She happens to be for sale with an asking price of 995,000 euros. 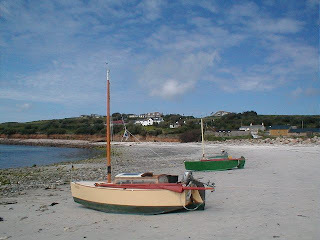 Here we have ‘Faith’ and ‘Little Jim’ at Porthloo Beach, St. Mary’s, Scilly Isles. Sailing in company was great fun. Both boats performed similarly, and seldom was one faster than the other. If one got ahead an appreciable distance, her skipper would spill wind until the other boat drew near. On passage we kept in touch via VHF. 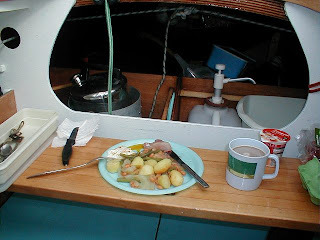 This was a typical evening meal aboard ‘Faith’. You’ll see a fried egg, fried bacon, boiled potatoes and French beans. Yoghurt was my favourite sweet. I didn’t put weight on, nor did I lose it. I did a fair amount of cruising with my Paradox sailboat, but the most memorable cruise was in 2008 when I sailed her to the Scilly Isles from Burnham-on-Crouch. During the cruise I took a good many photos, a small selection of which I shall be publishing here at my Blog. Al Law joined me at Plymouth with his Paradox, ‘Little Jim’. This photo of Al’s boat proves that Paradoxes have full standing headroom! 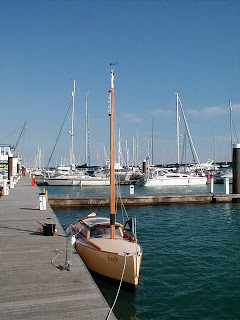 ‘Faith’ was the smallest yacht at Brighton Marina. I was at Plymouth for several days before Al could join me, and I took the opportunity for exploring the River Tamar as far as Morwhellham . Here’s a photo of ‘Shamrock’ at Cotehele. 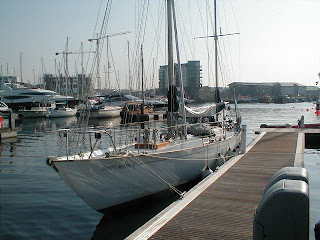 Francis Chichester’s ‘Gypsy Moth 1V’ was a visitor to Sutton Harbour Marina at the Barbican. I will publish more photos tomorrow. Coastal cruising in a yacht requires a lot of attention on the part of her crew, and especially so for a solo yachtsman. 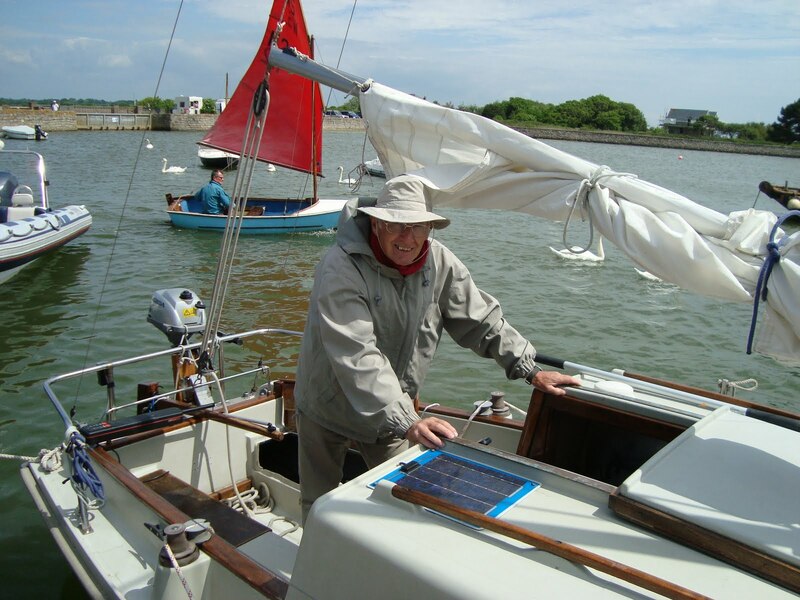 He has to work his boat, navigate, while keeping a lookout for hazards which may be anything from a small crab pot buoy to a high speed motor yacht. 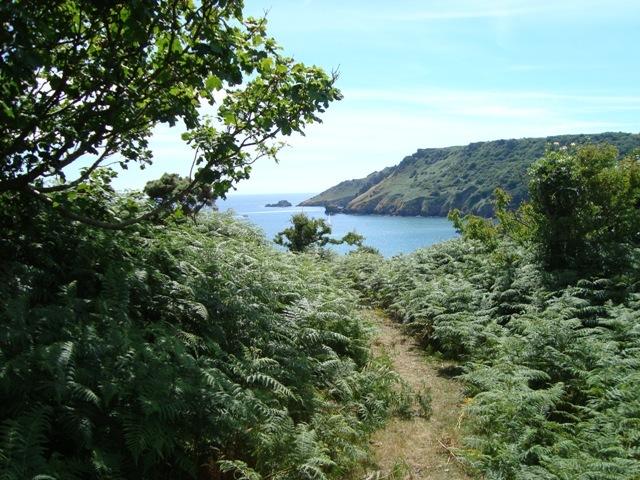 He has to take into account coastal features that could endanger his yacht - the most hazardous perhaps being a headland around which run fast-moving water passing over shallows. Crossing a shipping lane can be a very dangerous business because of the high speed of modern ships. Ships’ watch officers monitoring radar may not observe the position and course of a small yacht because of the diminutive target. 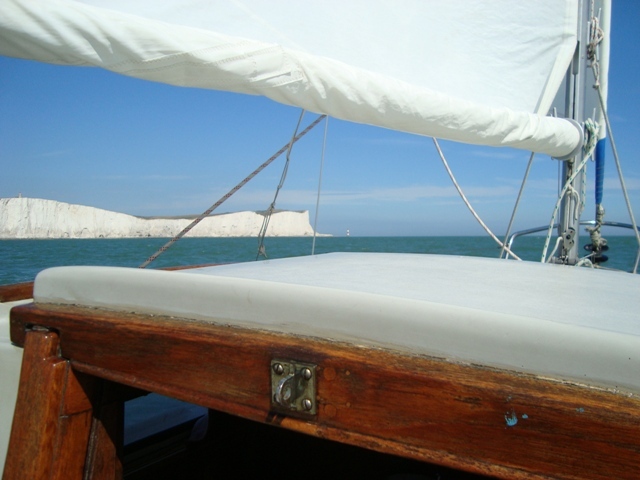 Beachy Head is a notoriously demanding headland for yachtsmen. When the wind blows strongly from the south west and the ebb runs against it, overfalls can make the going very uncomfortable. Dungeness can be equally demanding, but if the wind is light, the sea can be smooth; however, when the wind is light, progress around the headland can be very slow. Indeed, one can be sailing through the water while losing ground. 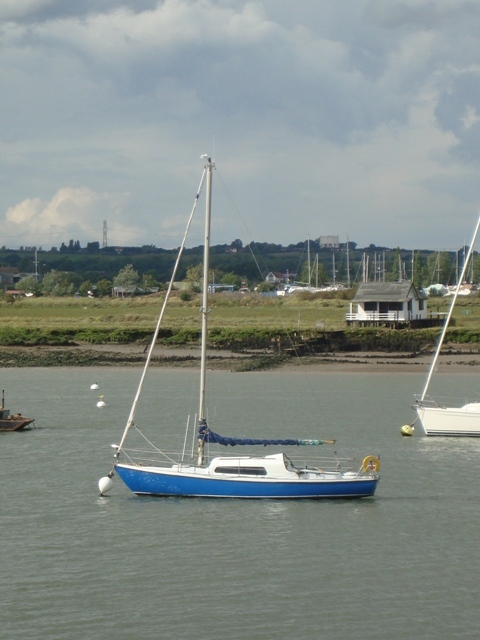 Under that circumstance it is better to anchor in shallow water either side of the headland to wait for a helping hand from the ebb or the flood tide, as appropriate. 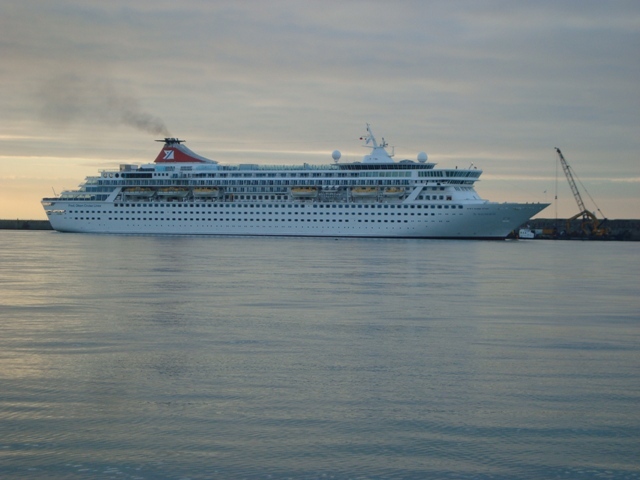 A most terrifying hazard is a large ship like the ‘Balmoral’ pictured above at Dover Harbour. At night she will display many lights, but identifying those that matter, i.e., the masthead lights and the port and starboard lights, is imperative for understanding her movements, so that evasive action can be taken if necessary. When you arrive at your destination you may be fortunate to come across a famous vessel anchored or moored there; such was the case with ‘Jolie Brise’ when I arrived at Falmouth. 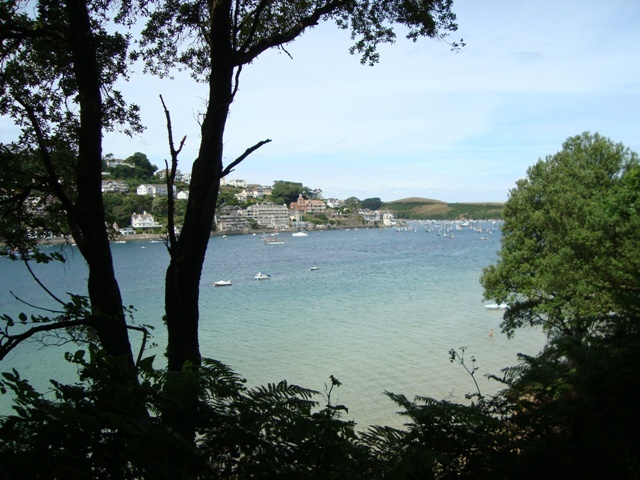 I took this photo of Simon Renton at Salcombe. 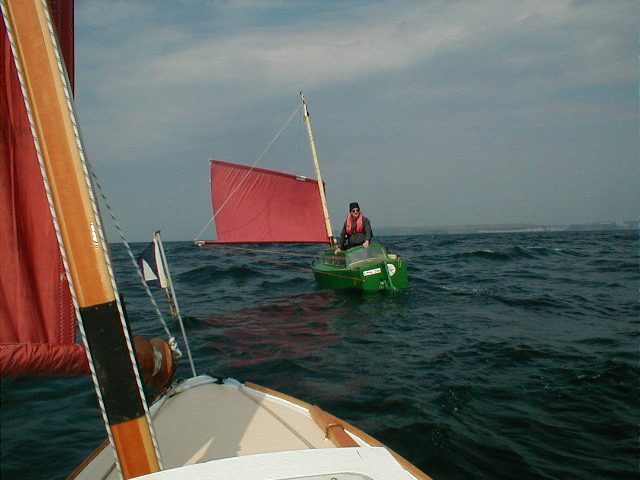 He was attempting to sail around Britain in a Wayfarer dinghy to raise funds for Macmillan Cancer Support. His latest blog is dated 14th May, 2011. I know that he ran into difficulties with adverse weather during his 2010 attempt, and had to give up. Last year ‘British Steel’ was in a miserable state when I took this photo at Dartmouth. The good news is that a group of enthusiasts are restoring her. 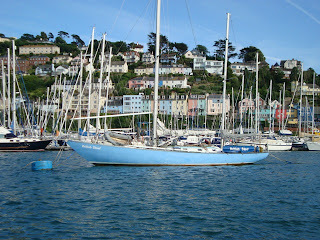 Here is a Troy class yacht I saw off the entrance to Fowey. 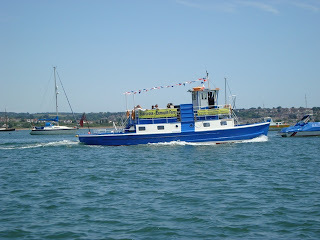 The Starcross/Exmouth ferry was a familiar sight as I lay to a mooring at Starcross. Continuing with my memories of last year’s very successful cruise to the West Country aboard ‘Ladybird’, my old Seawych 19 - here is a selection of photos. A coastal cruise on a yacht is not comprised solely of sailing; a major part consists of activities ashore. Indeed, the flavour of a cruise is often defined by these experiences, rather than those when at sea. Take this Brixham Trawler, for example; she was based a Torquay Marina. I had to pass by her every time I went ashore via the pontoon walkway. I was intrigued with her sturdy functional design and her battered, rust streaked hull. 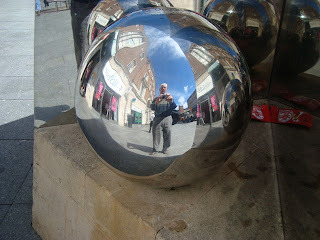 Walking along Exeter’s High Street I came across an innovative sculpture which was made from reflective materials. This mirrored sphere reflected a distorted view of the buildings, and an equally distorted reflection of me holding my camera. 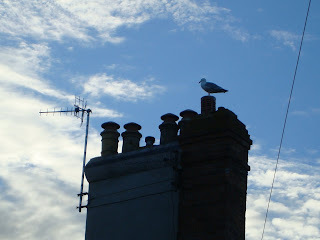 While exploring the backstreets of Weymouth I noticed that many of the older houses had numerous chimneys of different shapes and sizes. 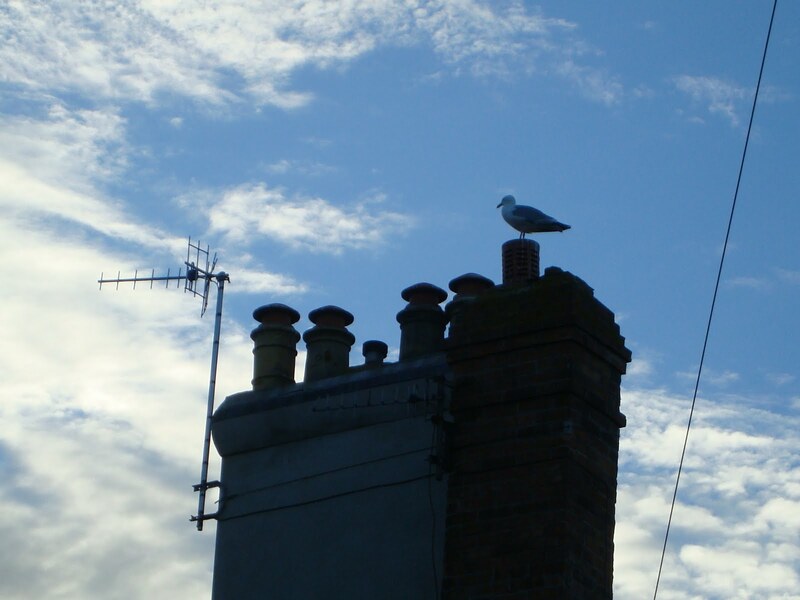 These are not elegant and they have little architectural or artistic merit, but they are striking with their cowlings and a gull perched on top of one. Here is a prettier scene, a view of Salcombe from the south east side of the estuary. I took it when on one of my coastal walks. If I could choose a motif, emblematic of Cornwall I would go for the Cornish pasty, but there’s a strong contender, and that’s the Falmouth Pilot Gig. I have visited Falmouth by boat on numerous occasions, and the image that comes to mind of that wonderful natural harbour is the vision of pilot gigs gliding to and fro. Of an evening they can be seen with their crews, male or female, youth or veteran, training and straining at their oars, accompanied by the lively rhythmic chants of their helmsmen echoing over the water. 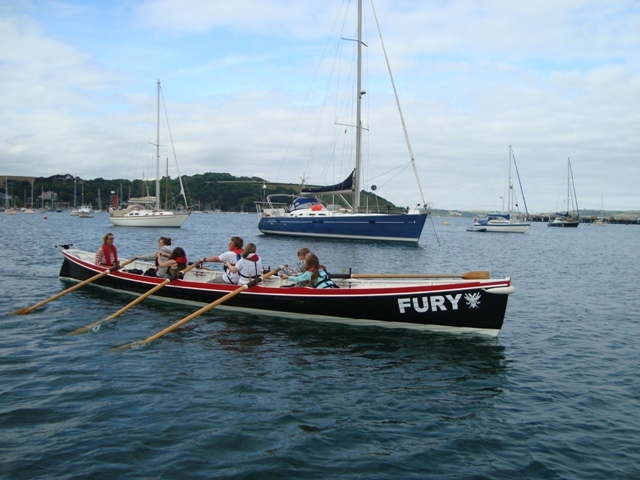 The oldest active gig is the ‘Treffry’, built in 1838 by the Peters family of St Mawes, now rowed by members of the Newquay Rowing Club. 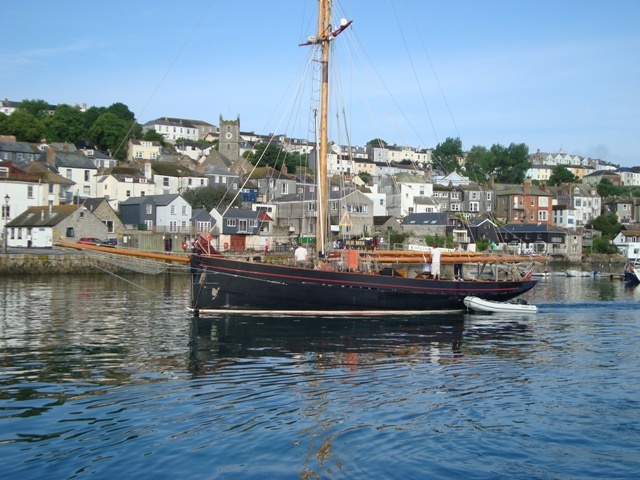 As the name suggests, Falmouth pilot gigs were specifically designed for transferring pilots from the shore to sailing ships arriving off the Cornish coast. The crew of the first gig to get a pilot aboard received payment for their service; unsuccessful competitors went home empty-handed or remained at sea for as long as they could in the hope that another prize would turn up. 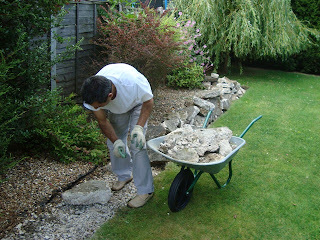 In the appropriate seasons gigs carried cargoes of potatoes and cut flowers from the Scilly Isles to the mainland. They were the earliest lifeboats, and the last known rescue was carried out by the crew of the ‘Sussex’ attending to the wreck of the ‘Mindau’ when she floundered on the Isles of Scilly in 1959. The ‘Sussex’ was built in 1886. She was owned by the late Ralph Bird, who was a skilled builder of gigs. I had the pleasure of briefly meeting Ralph who was a friend of a friend of mine. The ‘Sussex’ was originally built for the inhabitants of Bryher. 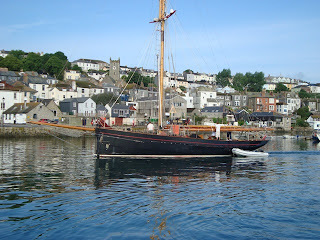 Now I believe she is currently on loan to the Porthleven Gig Club. 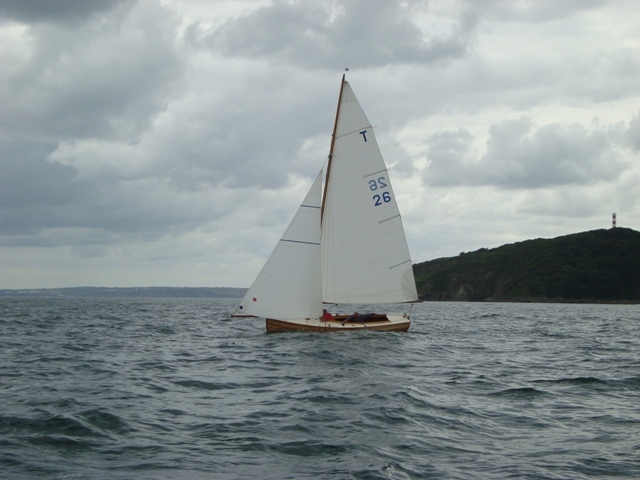 Modern six oared racing gigs are almost identical to the classic ‘Treffry’, built with Cornish narrow leaf elm, having an overall length of 32 feet and a beam of 4 foot 10 inches. If it hadn’t been for a handful of enthusiasts with appropriate boat building skills these fine rowing boats would have been confined to the archives. The last time a gig was used for transferring a pilot to a ship was in 1939. The decline of sail and oar for commercial purposes came about with the introduction of steam-powered vessels at the end of the 18th century. Gigs were no longer competitive; therefore they were left to rot or were broken up. The story has a happy ending, because gig racing today is a healthy expanding sport with at least 25 clubs in Cornwall, together owning around 50 boats. 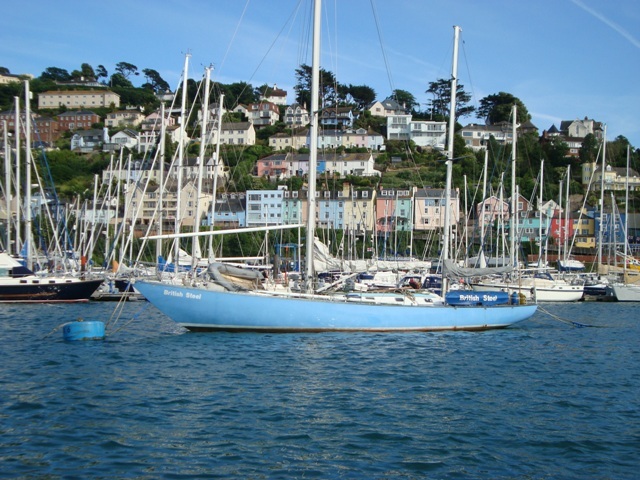 The Cornish Pilot Gig Association has a membership of 55 clubs with 145 registered gigs. 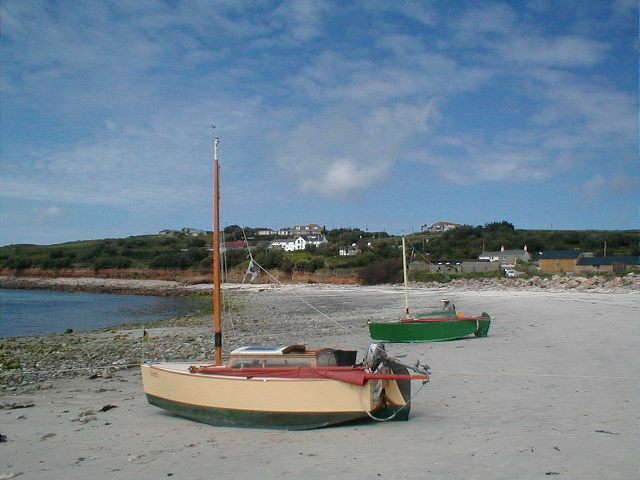 The World Pilot Gig Championships are hosted annually by the Isles of Scilly towards the end of April each year. There is a small level of sponsorship by firms such as the St. Austell Brewery, Rock the Boat and J. Sutton, traditional blade makers, but amateur enthusiasm, friendly competition, pride of achievement and self-support continue to be the driving forces behind the success of gig racing. May it continue. Rumour has it that the Falmouth Pilot Company is recruiting interested parties to provide traditional rowing gigs for the original purpose for which they were designed. The Company will be offering £750 per run to successful boats. Whether this is fact or fiction, I do not know, but wouldn’t it be good for the environment and a boost to those who love gig racing? 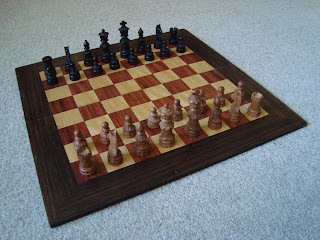 There are those who consider that the whole of life is nothing more than a game. For them, every activity is a game; to participate is more important than winning, because they seldom win; they simply survive for another game. Some play cricket, and play fairly; others doctor the ball, cheat and hope the umpire does not catch them out. Ultimately, the big game which is comprised of thousands of smaller ones comes to end, and the players are no more, or so they think. They forget that every decision and every action have their consequences – a lesson they should have learned when playing small games. Surely they must know there’s a price to pay when a bad choice is made; there is always a loss when a slip occurs, and when there is a foul a free kick is given, but when a game is played fairly and won, the victor receives his crown. An athlete must run* as if he is already the winner, but without preparation, without training, without practice there is no hope. He cannot possibly win. There can only be one winner of a race, i.e., the fastest who endures to the end with earnest dedication and anticipation. Is the game worth playing? Most definitely yes, when played honourably and for the right reason. Cheats, thieves, and sluggards can never win, because they do not play by the rules. The Ultimate Referee is also the Judge with x-ray eyes and the One who makes the rules for those who will receive the prize and also for those who won’t. The Italian film producer Livia Firth has her Green Carpet Challenge, and I have been occupied with mine, but I was in fact not on my own, because most of the challenge was taken on by my Italian son-in-law. 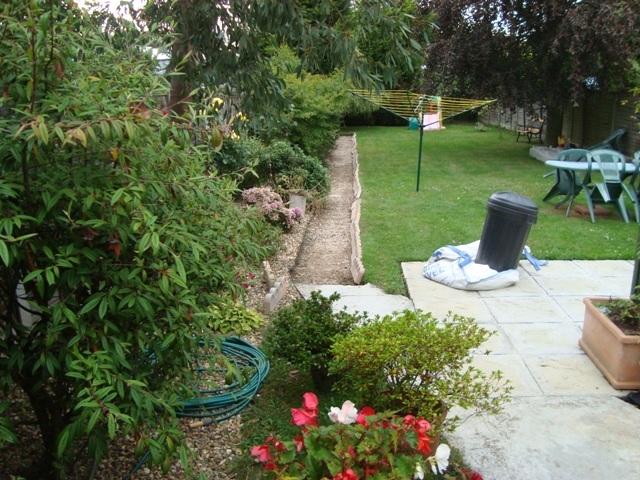 He demolished the old concrete garden path and prepared the ground for a carpet of green turf. 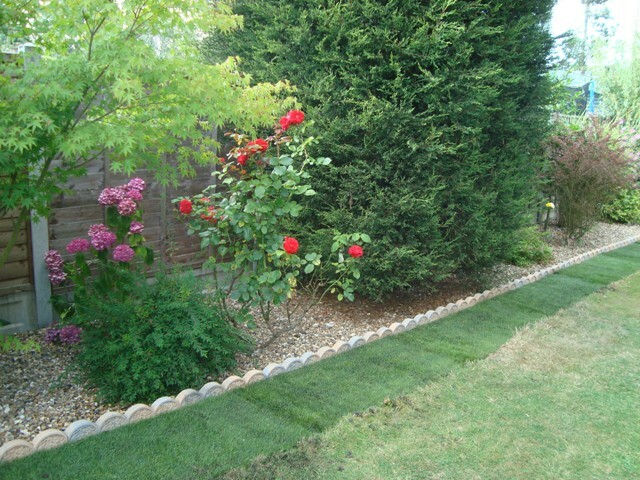 All I had to do was to roll the turf in place and bed it down before generously watering the almost perfect grass. The end result was an eco-friendly, green carpet of grass that absorbs sunlight, unlike the concrete path that reflected it. 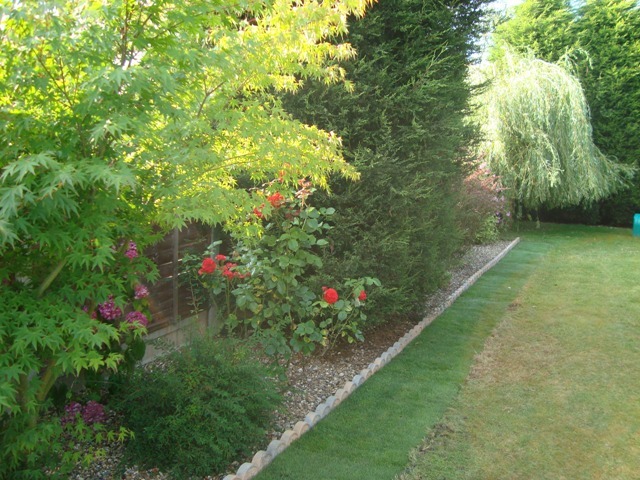 Worms and all manner of insects will benefit from the grass, and in turn, birds will take their fill of insects; afterwards they will leave their droppings for replenishing the soil and providing nourishment for the grass. Livia Firth champions the cause of recycling and ethical sustainable living. Her new website ‘Brightwide’ centres on political and social issues as portrayed in films. She wants her audience to become active in issues arising from them, so that they can make a difference by engaging in the political sphere outside of Parliament. Brightwide has links to Oxfam, WWF, and Amnesty International. The past can never be relived, but memories can linger on. 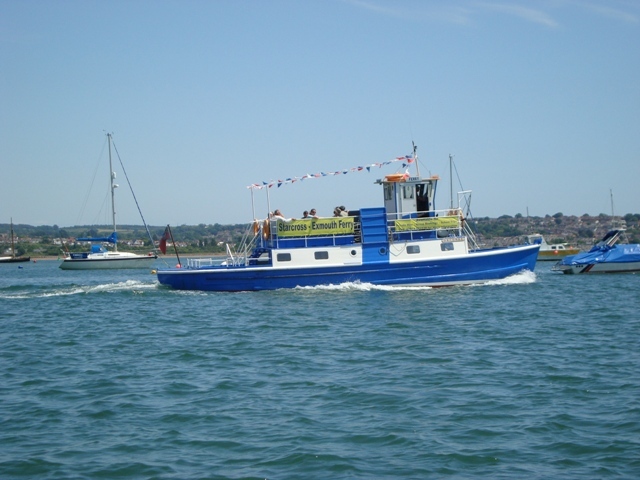 I have fond memories of my two month single-handed cruise aboard ‘Ladybird’ last year. A glance at my photo album reminded me of the wonderful time I had, including a full gale at Exmouth and a more than exhilarating sail from there to Weymouth. 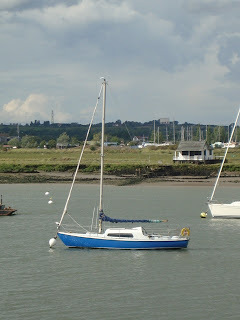 I set out from Burnham-on-Crouch on Thursday, 3rd June and returned to my Burnham mooring at the end of the cruise on 30th July. 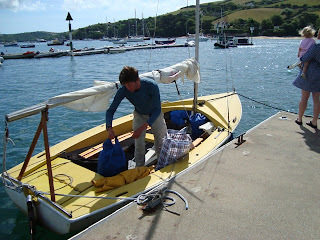 My 19 foot Seawych sloop looked after me during that adventure to Falmouth and back, via the south coast of England. The more I sailed her, the more confidence I gained in her. My Sony Cybershot digtal camera was useful for making a visual record of the cruise. I took hundreds of photos. Looking at them now on my computer, I am appreciative of how fortunate I am to have good eyesight, not only for seeing the photos, but for going about my normal daily activities. Those of us with good eyesight can take it for granted, and not realize how necessary the sense of sight is for day- to-day living. We see millions and millions of images every day and give little thought to them, and yet our very lives rely on what we see. Selecting a few photos representative of my cruise was not an easy or instant task, but here they are. Goals are a means of achieving an objective; in the case of a football match, the team that scores the most goals is the winner. At this moment in time there are several ocean sailors looking to score goals. I mentioned Sven Yrvind yesterday, who wants to score a goal by visiting the island of Madeira while on his way to Florida. After Madeira, he will want to reach the West Indies before continuing to Florida. Laura Dekker is about to enter the Torres Strait, and she has already scored many goals by visiting islands in the Pacific Ocean, the most recent of which was Vanuatu. After the Torres Strait she’ll be aiming for Darwin. Closer to home, there’s a series of yacht races under the banner of ‘La Solitaire du Figaro’. Solo competitors are racing identical 10.10 metre Figaro Beneteau 2 yachts. Finishing each of the four legs are the main goals of the sailors, but inwardly they must want to win as many of them they can, and ultimately, their dream would be to be the overall winner. The last leg will start at Les Sables-D’Olonne on Sunday, 21st August, and the race will finish at Dieppe. 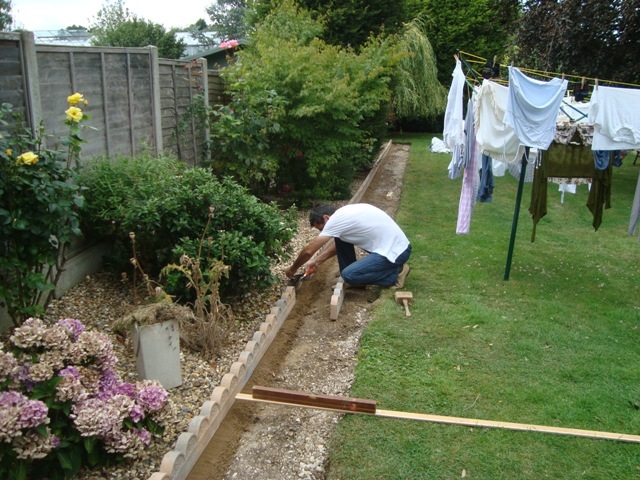 My son-in-law scored a goal today by completing the penultimate stage of reinstating my back lawn; he filled the void that was caused by the removal of the old concrete path. One more goal has to be scored to achieve the objective, and that’s to lay turf over the topsoil. Unfortunately, my son-in-law will not be able to lay the turf, because his holiday will end before freshly cut turf will be available on Friday from B & Q. After starting an activity there is opportunity for making progress towards a finish. Without progress, the end cannot be attained. At this very moment Sven Yrvind is sailing towards Madeira aboard his micro-sailboat, ‘Yrvind.com’. As mentioned in a previous blog (see Links below) he hopes to reach Florida for a meeting with Matt Layden. There have been comments on various Internet forums about Sven’s apparently slow progress. At 1751 on 16th August his position was 048.73 degrees north and 008.96 degrees west. 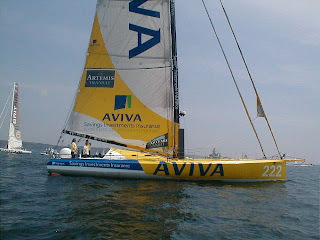 He departed from Kinsale Harbour on 11th August at 0948, which means he has been at sea for 5 days and 8 hours and he has travelled a distance of about 130 land miles/113 nautical miles, averaging 0.88 knots, i.e., doing 21 nautical miles a day over the ground. The distance between Kinsale and Porto Santo, Madeira is roughly 1200 nautical miles. If he is unable to increase the average speed of his yacht he will take 1364 hours which is nearly 57 days - that’s approximately another 52 days to go from his position at 1751. The conditions he is experiencing are rather rough. Only today there’s been news of a Fastnet Race yacht that lost her keel, not so very far from Sven’s position. He mentioned at the outset that he would be looking to ways of self-steering his boat. He had not devised or perfected a means of self-steering and I believe he has no radio for communicating with the outside world, except in emergency via his Spot tracker. Therefore we do not know if he has been successful in getting his boat to self-steer. Without self-steering, he will have to heave to and take sleep. According the wind charts for tomorrow, Sven will have a favourable north easterly wind of about Force 2. My son-in-law is making ‘progress’ with reinstating the lawn edging. I would like to be out sailing, but there are jobs that need doing. Priorities require action. 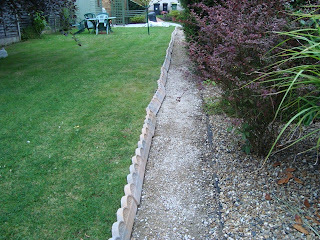 My son-in-law ripped out the old garden path that contravened my wife’s health and safety act! 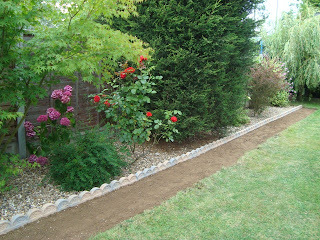 Consequently she decreed that the path must be replaced with turf. 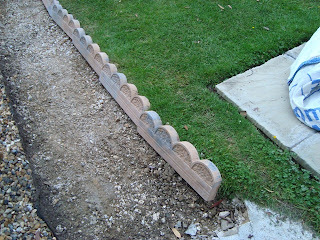 It was originally put in to provide access to a long clothes line. Then, in the early 70s, rotary clothes lines were few and far between. In fact, I can’t remember seeing them at all, but I do recollect washing was hung out to dry in most gardens on the first working day of the week. Both my wife and I were brought up in the days when every good housewife hung out her washing at dawn on a Monday morning, and fish was always eaten on a Friday. Society was far more cohesive with almost unbreakable rigid structures determining social behaviour – there was church on Sunday, of course, and there was a respect for persons in authority, unlike now, as witnessed by recent riots and looting in UK cities, particularly London. 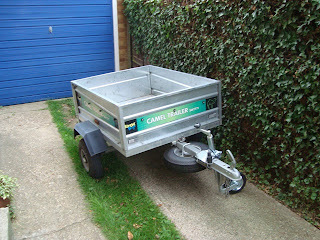 Today, I borrowed a small trailer from another son-in-law for transporting lawn edging from a garden centre. 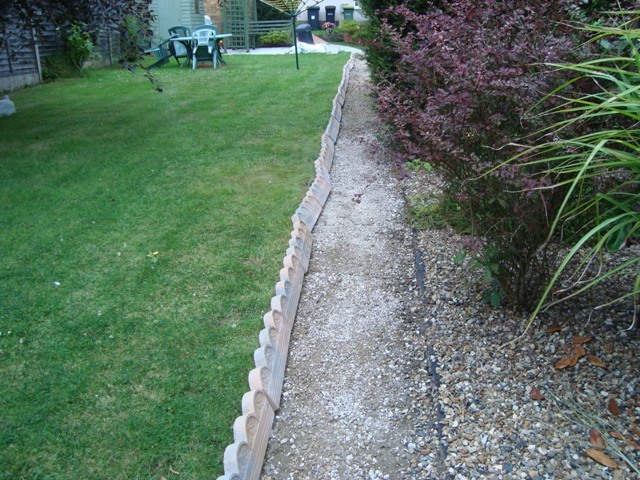 Each scalloped edging piece will be set in sharp sand to form a continuous miniature ‘wall’ that will separate the lawn from a border of small stone aggregate. 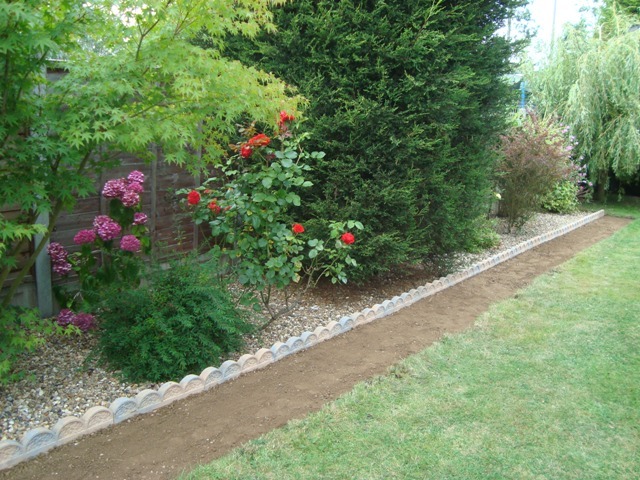 I shall have to obtain about three square yards of top soil for replacing the bulk of the old concrete path, and for providing a good base for the turf. None of these things are cheap, but the job has to be done. Peace shall reign and the garden will be a safe place, just like Eden until the Serpent appeared.